In addition to the Sakura Grove add-on we've created for Entanglement, we've also been hard at work (with a little help from our friends at CrateSoft) creating a version of Entanglement for iOS. We're proud to announce that the iPad version of the game is now available on the iTunes App Store. For $3.99 you can buy it here. The iOS version of Entanglement features four game boards, the classic board (seen above) plus three new boards exclusive to the iOS version. It also features a new mode, Gold Rush, which adds a twist to the traditional Entanglement by introducing golden paths to the mix. Cross a golden path to uncover a gold nugget. Earn points for each tile the nugget crosses returning to the mine cart. We're very proud of what we've created in Sakura Grove and now in Entanglement iOS. 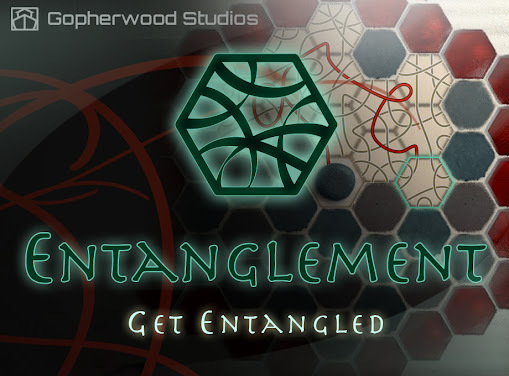 We hope you'll take the time to check out the new modes and maps we've created for both versions of Entanglement. Don't worry, the iPhone version is "in review" so it should come out in the next couple days. The multiplayer is local only, but we implemented Game Center so you'll be able to compare scores with friends. amazing game i love it so much! any chance of an android app anytime soon? Just discovered the game a couple of days ago and I want to second sgeist question. I'd love an android app. Is one coming next week? Since you're adding new approaches to scoring, I had this idea. The main path is the only scoring path, what if the other paths could score as well? Each tile that is played has 2 paths that are white (apple blossom), 2 paths that are pale pink (cherry blossom), and two paths that are pale blue or periwinkle (? blossom). When you place the tile, the original path advances and scores as usual, but each of the colored paths, if they extend a path of the same color, would also score something. Score how? It depends on how much you want these to contribute to the score. They could score like the original path, but that seems high to me. Maybe just the colored path length ( minus 1, don't want a path of length 1 to count for anything ). Did you get the idea for Entanglement from Tom McMurchie's "Tsuro"? 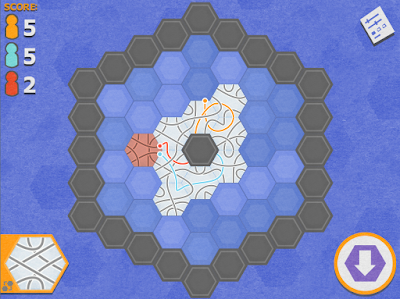 I like the change from squares to hexes, but it's basically the same game. @Rolan - thanks Rolan, that's an interesting idea. @Oddbod - I've actually never played Tsuro, but I did draw the original inspiration from browsing through pictures of Tsuro and several other tile-placement board games on boardgamegeek.com. A key feature I like from Tsuro is having two endpoints on a given side of a tile, which really opens up the game play and makes it interesting (moreso than, for example, Pipe Dream) by allowing loops back over placed tiles more often. I can't get rid of the tutorials. i have never had the chance to tap the fourth tile before the game simply crashes and goês to IPad main menu ... Sometimes it does on the second tile! It's a very nice game on Google, get a quick fix, or refund! We released a patch that fixes that problem. If you update the application everything will work correctly. Also, when the tutorial says "Tap to Continue" tap on the screen somewhere not on a button or the tile in play. If I purchased Entanglement through google, is the ipod version available at no additional charge?